UFC lightweight champion Conor McGregor wants to continue both a mixed martial arts and boxing career after Saturday's super bout with Floyd Mayweather. Wednesday's final news conference at the MGM Grand in Las Vegas proved far calmer than any media event in the build-up to what could be the most lucrative fight in boxing history. McGregor, 29, will earn a reported $100m in his boxing debut at the T-Mobile Arena event, prompting speculation future UFC pay days might not keep him with the organisation. He said: "When this one is done I will have 20 seconds where I relish in victory and then I will be thinking who is next? I will be looking to compete all over the place. "After I get victory I will certainly be looking to compete in both sports. Since I'm the king of the boxing ring and king of the MMA maybe I will make my own hybrid. Then if anyone wants to challenge me they can do it in my octagon." Mayweather cut a refined figure at the MGM event, which was closed to the public. 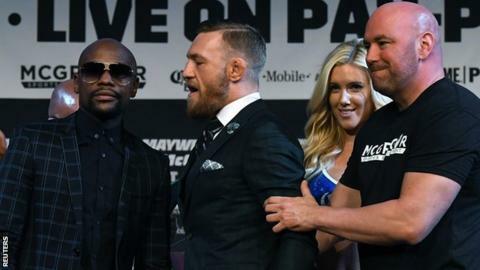 He was seemingly uninterested in exchanging insults, while McGregor had no such qualms, pointing to social media posts his rival has shared of betting slips and stating he thinks Mayweather "may have a gambling problem". The undefeated boxer's father - Floyd Sr - told reporters "a lot" had been taken away from his son's ability in his two years out of the sport but stressed he still had enough to overcome McGregor. But Mayweather was defiant when telling BBC Sport he was "going to look good" as he bids for a 50th win from 50 fights. "I don't miss the hype and this at all. I'd rather be at home watching TV but this is my job," said the 40-year-old. "McGregor can say whatever he wants to say, when it comes down to it I can fight. "Mentally, no athlete in the world is stronger than me. "To be here 21 years I had to take it extremely seriously. You guys think I am not taking it seriously? I am." It was announced the winner of a bout many in boxing have rubbished will receive a one-off belt from the World Boxing Council called 'The Money Belt'. It contains 3,360 diamonds, 600 sapphires, 300 emeralds and 1.5kg of solid gold, mounted on alligator leather. It is the latest opulent addition to a fight which could earn $600m (£469m) and which will challenge the record of 4.6 million pay-per-view buys set when Mayweather defeated Manny Pacquiao in 2015. Stephen Espinoza, the head of the Showtime network, told reporters breaking the record was "in the realm of possibility" and stressed a key factor was that the fight will be televised in more than 220 countries, a marked increase on the Mayweather-Pacquiao reach. "If we don't get there, it will be very close," he said. Potential record pay-per-view income, added to merchandising, ticket sales and sponsorship will deliver McGregor the type of purse which will only prompt further questions as to how UFC can satisfy its main star when he returns. His exact earnings will remain unknown thanks to a non-disclosure agreement signed by both fighters. Get the biggest boxing news sent straight to your device. Find out more. UFC president Dana White told reporters it was possible the pay day could prompt McGregor to retire, adding "whatever happens, I'm happy for him". "When he knocks Floyd out his legacy will be that he is the greatest combat sports star ever," White told BBC Sport. "He will be the biggest star on earth." White also hit back at criticism of the bout, singling out legendary boxing promoter Bob Arum as an "idiot" and a "moron". "Arum said this is like LeBron James fighting Anthony Joshua," added White. "Conor McGregor is a fighter and has done it his whole life. It is not the end of the world or the end of boxing if he knocks Floyd out on Saturday night. "The naysayers will be asking different questions on Sunday morning. This is not a boxing match, it's a fight." Read more on Podcast: Is McGregor feeling the pressure? The modern UFC performance institute is the slickest of finishing schools, but can it produce the next Conor McGregor? Floyd Mayweather's name draws fighters from around the globe to his Las Vegas gym, but what lies inside - and how do you get in?